John Sellers: "They're after me." Because it wasn’t the only edition of the yearbook that burned. 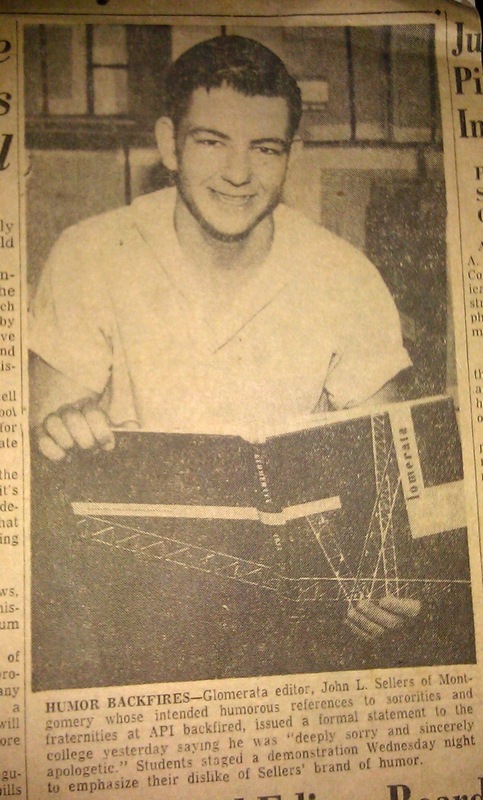 The same fate met the 1955 Glomerata, this time in a S’mores-less bonfire in Ross Square, but not because editor John Sellers downplayed the Greeks in the book’s version of Auburn (as was done in 1970), but because he used their money—fraternities and sororities paid $145 for their pages—to mock them. Previously, the tone of the fraternity section was all tame inside jokes and (mostly) wholesome LOLs. Sellers, as part of his attempt (that also included major design overhauls) to revamp the Glom’s vibe, went full-on snark. The Alpha Delta Pi’s devoted their time to mankind (“with the emphasis on the “Man—the “kind” doesn’t make much difference.”) The braniac Alpha Gams maintained a “B” average (“could this be why they’re called the B girls of the Plains?”). Turn your back, and they’ll be with another. The Pike’s apparently dated dogs…Pi Kappa Phi’s favorite charity was the ABC Store… you get the picture. The frats got the matches. But, amazingly, the best part of the story isn’t the Glomfire, it’s the attempted lynching. This was 1955, after all. The respect for human life that might have muted Auburn student wrath to Threat Level: Effigy Burning was still 15 years away. Thank God for former star Auburn running back and Alabama governor Fob James! From Fob: The Incredible Story of Fob James Jr.
Foy said James reminded the students everybody had exams the next day and said he knew they had to study like he did and why didn’t they go on home and let the publications board [the joint faculty and student committee that supervised all campus publications] take care of the yearbook editor. And they did. Sellers was chastised. Bad taste. Poor judgement. The works. Sellers sent his own apology to the school and the offended organizations, writing “We did not intend in any way to degrade any group at all. We tried to poke fun at all groups and not limit it to any single one. I should say not. So stay away from the window, future Glom staffers. Yearbook burning and threats of bodily harm to editors are apparently a learned behavior at Auburn. You can’t be too cautious. Related: Never-before-seen photos from the great 1970 Glomfire. If you like TWER? Please consider helping us keep on keepin’ on with a modest donation. That’s Awesome! Where could one see a copy of this? I bought a 55 Glom at an antique store and posted the pictures and captions on my Fraternity’s Facebook page. There were some questions about the comments in the yearbook. This article explains a great deal.